If you are looking for something a little different to compliment your living space . . . how about these prints ? Reminiscent of a past era, perhaps something similar would have graced the wall of an idyllic station ticket office in the 30’s. 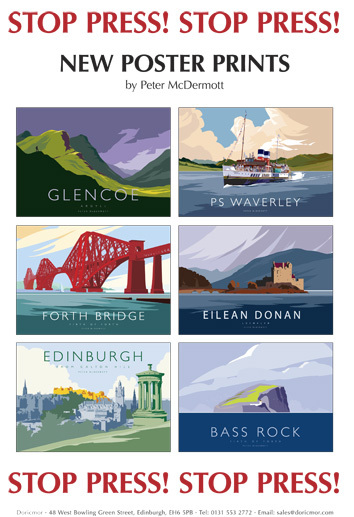 Peter has diligently created 6 scenes, Glencoe in Argyll, Edinburgh’s Forth Road Bridge, Eilean Donan Castle in Lochalsh, Bass Rock on the Firth of Forth, Edinburgh viewed from Calton Hill and the world’s last sea fairing paddle steamer the PS Waverley. If you would like to find out more, and you are a trade customer visit us with Doricmor at Scotland’s Trade Fair (Spring) in the SECC Glasgow this Sunday 27/01/08 until Tuesday 29/01/08. All you need to do is get there ! Alternatively, search The Bay Attic website, as we are updating and adding new items regularly. I really love these ! They will make great posters, very bright and eye-catching. Would like to see more of the same. Really like the retro feel. Especially Eilean Donan and Edinburgh. Apart from the images, I think the typography works best on those as well.